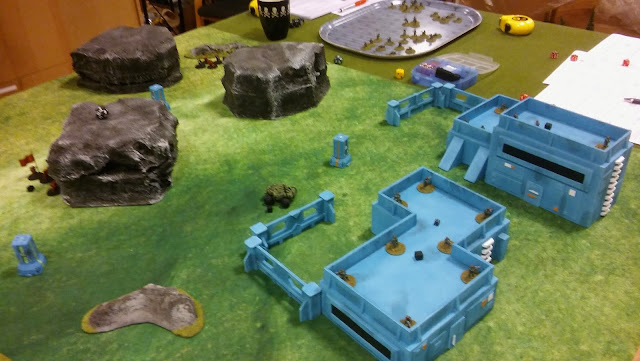 With this battle report I'm up to date with the campaign. It'sa niiice! This is the battle of the 14th Colonials. As always, we rolled for terrain and mission, which gave us the Invasion scenario on a barren world. It felt good to leave the city, sort of. Since the rapid evacuation of captain Staya, the not that successful CEO of the Sickles, the company has established a base on this barren world. Not long after, the Varuna Legion, invades to try and occupy the base. 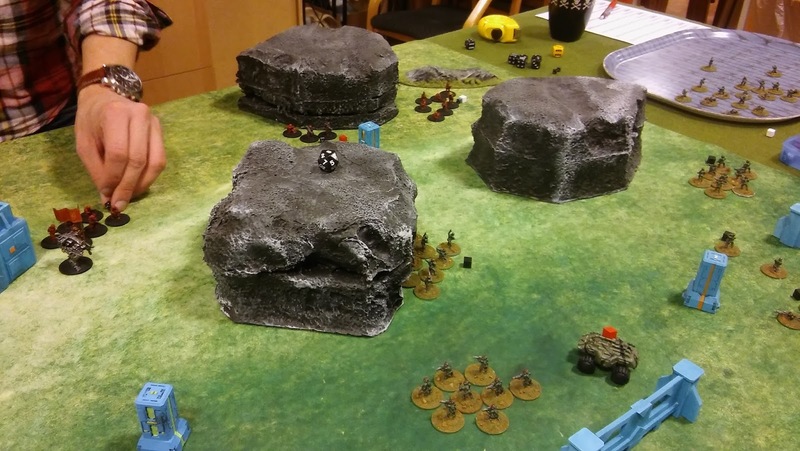 The smoke lays thick as the invading forces tries to get cover during the precious first seconds of the assault. The defenders has called for reinforcements which has responded, to fight back the invaders together as comrades. But what they don't know is that the Varuna Legion is deploying some of their crack units onto the battlefield. "Open fire! Fend off those pesky capitalist mercenary invaders!" Velocity Vintovkas, Tier II Rookie Rifle Team. Panzer Projectors, Tier II Rookie Rifle Team [new!]. Honour Holders, Tier I Recruits. Ground Gagarin, Tier II Remote Mortar Section. Crocuta, Tier II Lhurgg Heavy Patrol Vehicle [new! Since the first of this kind blew up first game!]. Ataka Away, Tier III Rocket-Armed Team [the heroes of the company, that are responsible for wiping out 100% (read: 1) of the enemy units!]. Note that the Lhurgg units were on relax and spa, due to 'a lot' of trauma points... Droids needed a service, ya know, every 10000 miles and so on. With so many new units, I got no kUC:s left. I hope I'll get some stash this time! Tier II Heavy Patrol Vehicle, with Incendiary rounds [!!!]. Tier III Light MG Team. 2 Tier II Rookie Rifle Teams, including Varuna Defenders (Determined). 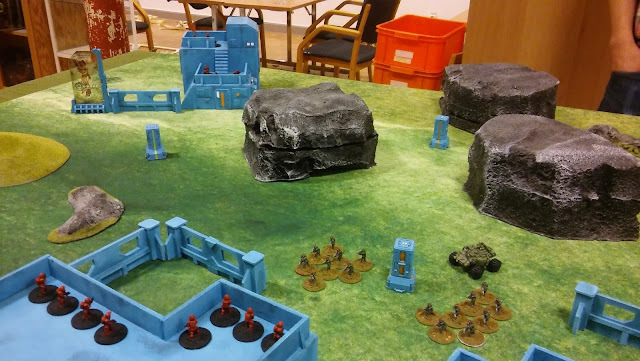 In the foreground we have the Panzer Projectors (their first game). Far away we see Velocity Vintovkas, joined by captain Staya (but not Stoy who got treats at the spa and relax due to animal rights in the 27th century). The blue pillars are the three landing zones we were fighting for. 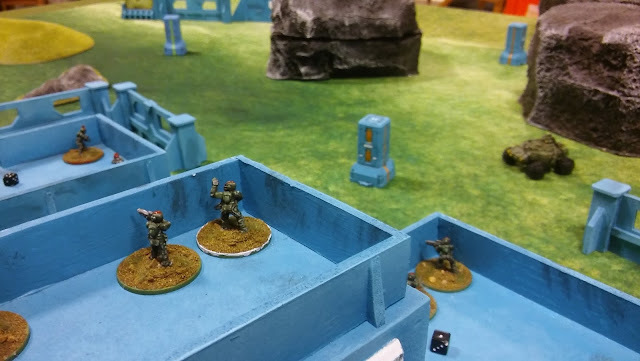 The Varuna infantry unit on the left is the Varuna Defenders, joined by another rookie team and their vehicle. I got the first round, trying to open fire and taking advantage of the received suppression the landing troops gain. Sadly for me, to no effect! My other unit, Velocity Vintovkas, was out of range but moved out of their safehold to assist their troubled allies. Well, I tried to get into position with the aiding troops, but the ones who was getting help was now dead. So, instead of aiding, it's now time for revenge! In the meantime the Varuna Legion got comfortable in the base and even parked their car outside the front. But we'll shown them whose (bad) neighborhood this is! Parked car, in the wrong neighborhood. End of turn 2. Overview of the battlefield. Reinforcements has arrived for the Sickles; the Honour Holders! Reinforcements has arrived, and it's the famous Ataka Away! They were able to walk in, casually, and fire a missile, casually, at the Varuna vehicle which blew up! Casualty! hehehe! The anti-tank rule doubles the roll of the D10, so a '5' was enough to finally blow that vehicle up! It had given me huge problems during game 1, 2 and 3. Ah, the sweet taste of revenge! Please note that Ataka Away still stands for 100% of the destroyed units by the company, I'm impressed! The Honour Holders also joined the fight and took positions on the right flank. Velocity Vintovkas got ready to retake the base and moved forward, guns blazing with no effect. The Lhurgg walker, Crocuta, joined the fray but was out of range to engage. I could feel the winds of change! Next turn, I could engage with all four units against two, odds were looking good for the Sickles! End of turn 3. The red cube at the vehicle is there to mark it as destroyed, unfortunately we had no smoke around. More reinforcements! More more more! Ground Gagarin hit the field and started launching grenades down the base, also, with no effect. The Varuna Defenders rolled a hard '9' and sent Velocity Vintovkas crying, pulling back with the company banner, leaving comrades behind. This pretty much halted the advance. 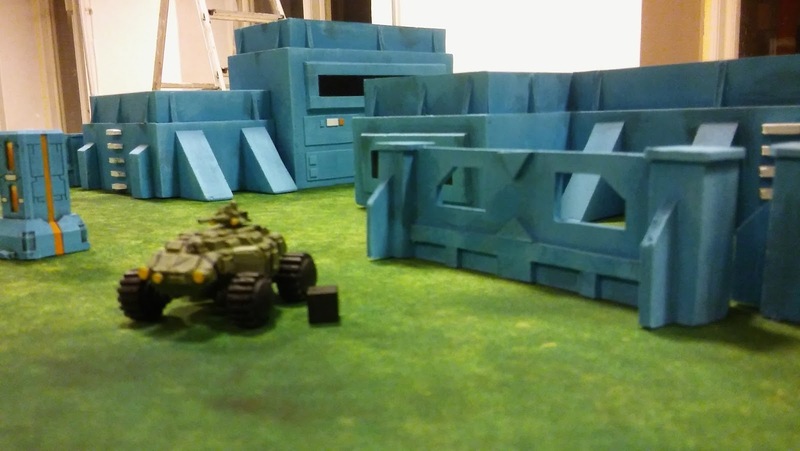 Units in buildings gain +2 Firepower and Defence. That is very scary for low tier units to compete against! Buildings are a fearsome force multiplier! I could only hope for my units with destructive weapons to score a good hit and raze the base, with Varuna units under the concrete crumbles! My hope stayed with Ataka Away and Ground Gagarin. Second wave is here to save the day, for Joel at least! 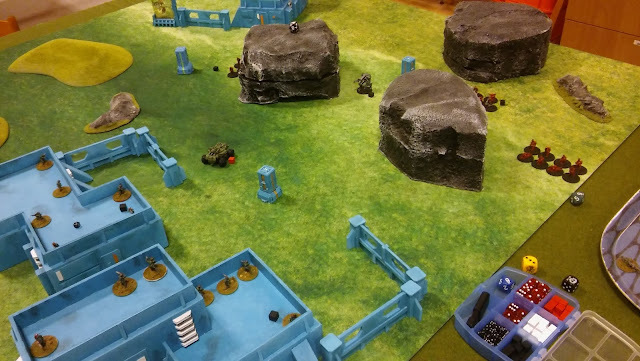 I repositioned Crocuta and Velocity Vintovkas actually got back in the game, despite having lost two troopers. 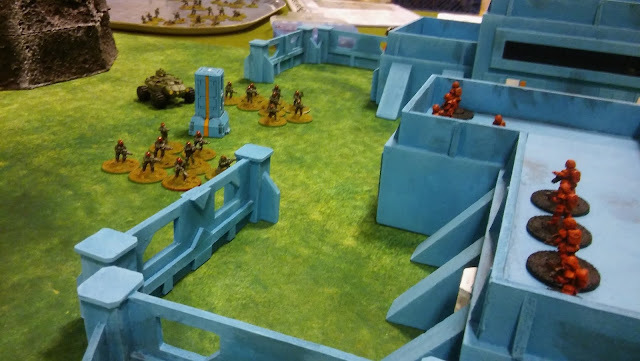 The Varuna field commander started shouting orders to the left and right, letting the MG team ripp against Ground Gagarin, killing one trooper and sending the other one off the board. The Varuna Legion was now advancing on all fronts, leaving the newly captured base too make a counter-counter-attack! Taking the point was the Tier 1 squad of irregulars. What a spearhead... Ataka Away lost a member, fleeing. So did Honour Holders (Honour Droppers?). What the...!? Did I do anything about it? Yeah! Fired with all I had on those irregulars in the i middle. They were close, they were without cover and were fired upon like six times. They didn't even get suppressed! Hence, they are now the 14th Colonials. A named unit, even without a level up! For having only a defence of 7, those guys were stubborn! I just wanted to say; I kept track during the game, being used to roll awkwardly bad. I rolled no '4', '6', '7', '8' or '9' during the whole game! I rolled '5':s twice, that's it! Rest was, well you guessed it... low (a roll of 0 is zero). At the meantime, I must admit thou, Joel plays solidly and never leave anything to chance! Hats off comrade! Last turn, he sent Ataka Away, away. Same with Honour Droppers. He also blew up Crocuta (!) with rifle fire (!). So I gained over 9000 trauma points due to being routed and lost two Tier II units, which costs a total of 8 kUC. Noodles for the company from now on! And we need those Lhurggs and droids back! Stoy can fetch them maybe. Turn 6. Before the bitter and dark end. "Comrade captain Staya Sir? May we have water to the noodles Sir?"